The ACP Women Series (ACP WS) is a tournament circuit organized by the ACP (Association of Chess Professionals), which regroups the most important tournaments in the world where women take part during a one-year chess season. Players taking part in these events gain points according to a ranking system devised by the ACP. Special prizes will be awarded to the best players, once the season is over (see point V.) . The 12th ACP WS take place from January 1st until December 31st 2019. A tournament is eligible for the 12th ACP WS if the date of its first round is included in this time span. Events played at both classical and rapid time-controls will be counted, albeit with an inferior coefficient for rapid events compared to classical ones. Classical events are those where a player has at least 90 minutes (regardless of possible time increments) to complete the game. Rapid events are those where a player has at least 15 minutes (regardless of possible time increments) to complete the game. Blitz tournaments will not be part of the ACP WS, the only exception will be the World Blitz World Championship; its results will be taken into account with coefficient 0,25 to classical scale. A complete list of tournaments included in the ACP WS will be published on the ACP website (www.chessprofessionals.org) and updated as the season unfolds. Updated players’ rankings will be published on the ACP website (www.chessprofessionals.org) and shall appear within a week after one of the ACP Tournaments is over. Individual women events counted in the ACP WS can be held according to the following formats: round-robin tournaments (RR), Swiss systems (Opens) and knock-out tournaments (KO). Individual tournaments of the ACP WS fall into 6 different levels according to their strength (R). Within one level, ACP points are distributed using different coefficients, according to the type of tournament and the number of rounds. For the detailed tables of the ACP WS Points System for individual tournaments, see Annex 1. Any stage of any closed individual national cup or championship cycle (classic or rapid), whose strength ( R ) is less than 2376 but more than 2300 according to the ACP Points System, will be granted level Fn and counted with a coefficient 0,5 assuming that level F has coefficient 1. If R is less than 2300 the event will not be counted. Open tournaments played with less than seven rounds will not be taken into account. All tournaments of level F and higher will automatically be included in the ACP Tour. If an open tournament does not reach this level, any of participants who gets rating performance 2500 or higher can ask the ACP Tour Director to count his personal result for the ACP Tour providing him with a tournament's report with personal performances. The ACP Board reserves itself the right to refuse counting a tournament, in case the results appear particularly suspicious. This will avoid pre-arranged tournaments influencing the final players’ rankings. In the event of circumstances unforeseen in paragraph IV, the ACP Board shall decide on the matter at hand. Decisions from the ACP Board are final. 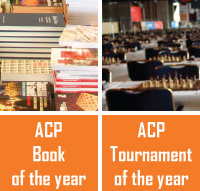 ACP points will be awarded according to the rating (Elo) performance and the place taken in a tournament. Tables of the ACP WS Points System for individual mixed tournaments can be found in Annex 2. Women players will be able to gather ACP points only in tournaments which are part of the ACP Tour. The list of these events can be found at www.chessprofessionals.org . Other events will not be considered for the ACP WS. Several very strong team events will be taken into account. These can include international and national competitions. Only individual performances are taken into account; the results of teams are irrelevant. For her performance to be rated in the ACP WS, a player must have played at least 5 games in a certain event. ACP points will be awarded according to the rating (Elo) performance. Tables of the ACP WS Points System for team competitions can be found in Annex 3. Only ACP Premium members are eligible for participation in the ACP Masters. A player has to be an ACP Premium member in 2019 in order to have his results counted in the tenth ACP Tour. To have ALL his results counted a player should become an ACP Premium member before March 1st 2019. //www.chessprofessionals.org/content/acp-membership-and-fee-structure-acp-... The deadline for membership renewal will be announced by the ACP Board in due time. The best eight players at the end of the season will be awarded money prizes. However, if the ACP succeeds in finding special sponsors, a Final Tournament will be organized. Money prizes would, then, be awarded according to the results of this Final Event. The player who obtained her ACP points in the least number of tournaments will finish ahead. If the number of tournaments taken into account is equal for several players, the player who finishes ahead is the one who scored the largest number of points, once the worst tournament of each player is withdrawn from the calculation; if it is not enough to make a difference, the next worst result is withdrawn, etc. If point “a” and “b” don’t break the tie, a drawing of lots will have to take place.